President Obama met with YSEALI members at the White House in June 2015. Note: this highlight was originally featured via ShareAmerica. Alumni from the Young Southeast Asian Leaders Initiative (YSEALI) will be meeting with President Obama in Kuala Lumpur, Malaysia, November 20 as part of a three-day networking summit. 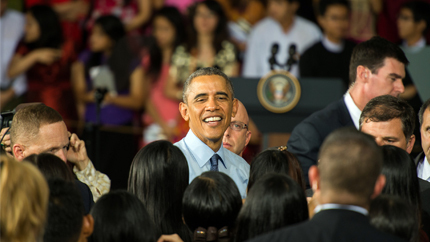 “You’re inspiring to me,” Obama told the YSEALI fellows he met with at the White House in June. “Across the region, you are civil society leaders working for democracy and human rights and religious tolerance. You are entrepreneurs who are turning your ideas into new businesses; activists fighting for the environment and against climate change. And that’s the power that young people have, and the spirit of optimism and idealism that you represent,” he said. One of those traveling to Kuala Lumpur is 28-year-old Sheina Onrubia from the Philippines, a city council member from Tabaco City. She had been unable to convince her local government to take action on reproductive health, even though her city had the highest teen pregnancy rate in Albay province. Her participation in YSEALI brought her to the United States to work with a nongovernmental organization that focuses on adolescent health and public policy. After her return home, newly inspired, she crafted a bill for her council that created a comprehensive policy on teen health, with a guaranteed annual budget. The legislation passed in October. YSEALI “made me dream much bigger for myself, my family, my country. It made me realize that I was born with so much potential and I could help immensely in building and uplifting the lives of my countrymen. I could make a difference,” Onrubia said. Amal Kasibah Bahari from Brunei is only 20 and still a student, but she has already co-founded the Youth Against Slavery Brunei organization to educate young people about human trafficking. She also gets them involved in identifying victims, most of whom are migrants seeking economic opportunities. YSEALI “not only provides young adults like myself the opportunity to travel abroad and embark on personal growth experiences that continue for a lifetime,” it also offers participants the chance to build meaningful friendships with people they meet, she said. In just under two years, the program has built up an alumni network of 35,000 people, 500 of whom will meet with President Obama in Kuala Lumpur. YSEALI offers workshops, online networking, exchange opportunities and professional development assistance, in addition to hands-on training in the United States. Do you have what it takes to join YSEALI? The program welcomes new professional and academic fellows each year from Brunei, Burma, Cambodia, Indonesia, Malaysia, Philippines, Laos, Singapore, Thailand and Vietnam. It’s easy to sign up by going to yseali.state.gov.